If you thought electric bikes lacked excitement, how does 0-100kmph in 2.9 seconds sound? Features world’s first tunable 'Active Acoustic Motor' and more! Electric superbikes have been restricted only to the race track, with either local or start-up companies intending to mass produce them. Also, the general perception among enthusiasts is that electric motorcycles lack the excitement of their IC engine-equipped counterparts, majorly due to the absence of the accompanying soundtrack. However, it seems like all that is about to change with Kymco’s recently unveiled electric superbike concept, the SuperNEX. The Taiwan based two-wheeler manufacturer, best known for its small-capacity IC and electric powered scooters, intends to change the perception of electric superbikes by being the first manufacturer to sell a mass-production electric superbike. Kymco has employed all sorts of tech to keep the experience as immersive as riding an IC engine-equipped superbike. For instance, the SuperNEX mimics the sound of an IC engine, thanks to the 'Active Acoustic Motor' and also gets a gear shifter. Yes, the SuperNEX features a 6-speed transmission with a slipper clutch and a quick shifter. Although it doesn’t necessarily need one to function, thanks to clutchless-shift tech, it’s been provided to enhance the overall ride experience. And, the SuperNEX just doesn’t claim to be a superbike, heck, it is one. To put things into perspective, it is claimed to make the 0-100kmph dash in under 3 seconds before clocking a top whack of 249kmph in a claimed 10.9 seconds. Kymco has also thrown in a ‘Full Engagement Performance’ system into the mix. This essentially includes launch control, traction control and a rear wheel lift mitigation system. While technology might be its forte, Kymco hasn’t compromised on design either. The bike sports a striking blend of silver, grey and red with futuristic looking LED lights at the front and back, with a modern all-digital instrument console. Additionally, the bike also comes with integrated turn indicators in the rearview mirrors, gold painted alloy wheels and gold anodized front forks. While the underpinnings of the bike haven’t been disclosed, from the looks of it, suspension duties are handled by upside-down forks at the front and a rear monoshock - both fully adjustable and sourced from Ohlins. It employs a twin-disc setup paired with Brembo four-piston calipers up front and a single disc brake at the rear. Even though the Kymco SuperNEX is still in the concept stage, it certainly seems to be an impressive proposition. 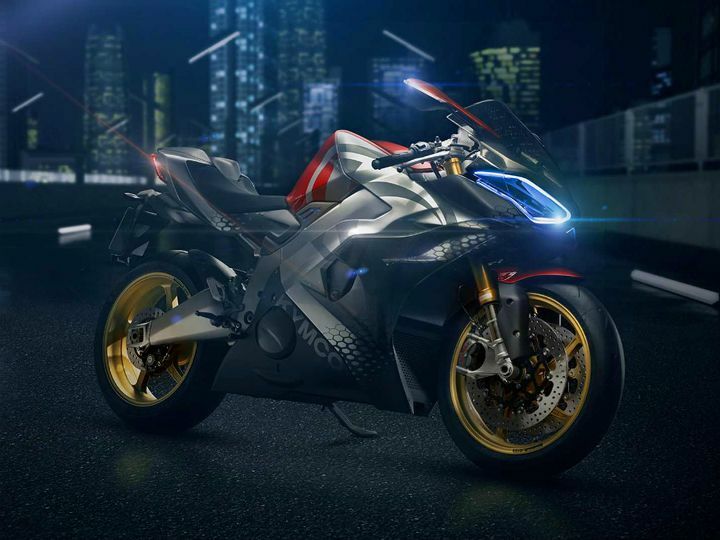 We can’t wait to see how much of the concept will be carried forward to the production-spec electric superbike.